One of the most well known crawl space vapor barriers in the market is the CleanSpace brand. We would like you to consider the differences and similarities in these two products. 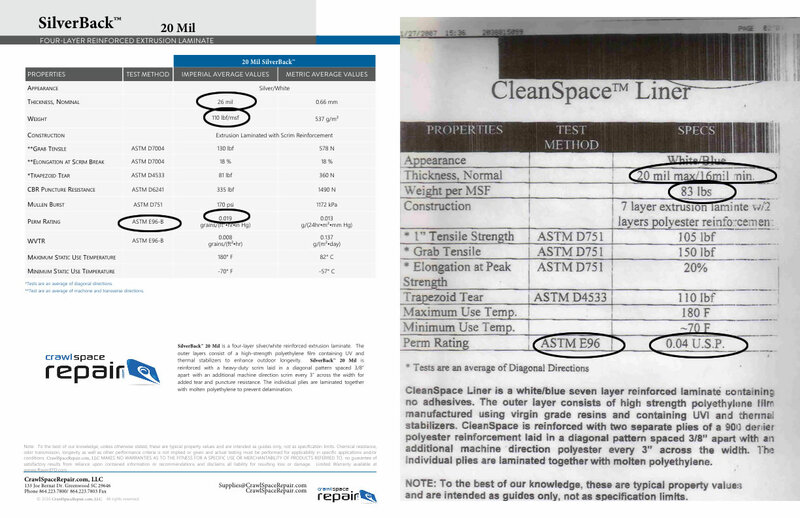 Available Widths are 6.75' and 13'4"
The spec sheets below show that the CleanSpace liner is max 20 mil and min 16 mil. These are the measurements on the plastic, 16 mil, and the measurements on the string (nominal), 20 mil. The SilverBack nominal measurement is 26 mil. Why do we call SilverBack a 20 mil then? To us, the only measurement that matters is the thickness of the plastic. We really don't care what the thickness of the string is. Almost all of the other products on the market measure at the string and not at the plastic without the string. 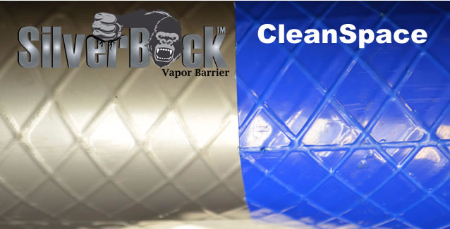 Looking further, you will see that the SilverBack vapor barrier weighs in at 110 MSF vs CleanSpace weight at 83 MSF. MSF stands for 1000 sq ft. So, the SilverBack has 110 pounds of plastic for every 1000 square foot and CleanSpace has only 83 pounds. That's a 27 pound or 32% difference in plastic used to manufacture the product!